AIIMS MBBS 2019 Dates : Reopening of Exam City Choice- Last Day to Apply, Hurry! AIIMS MBBS 2019: The All India Institute of Medical Sciences have announced to give another opportunity to complete the Final Registration Process. Thus, the candidates who have completed their basic registration generated a unique code, but could not fill their examination city. The link is activated from 5th April to 9th April 2019. Only those candidates will be able to make their exam city choice who have completed all the steps. 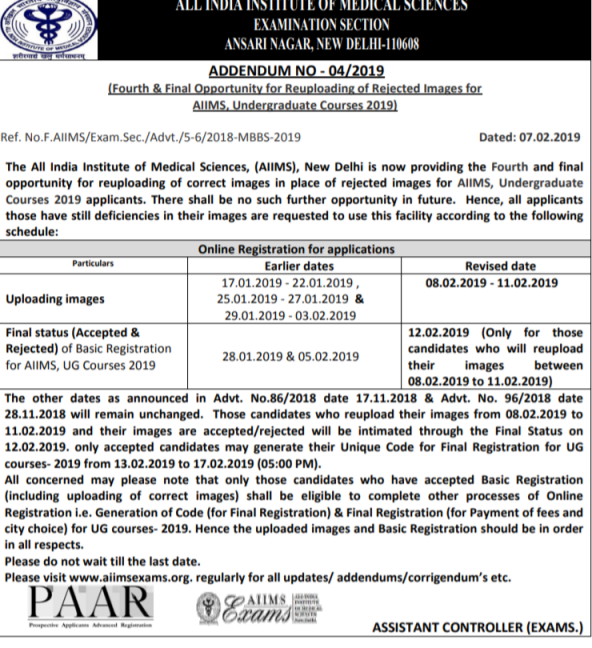 The AIIMS MBBS 2019 examination schedule for the academic session 2019-20 has been published. The exam will be held on 25th May & 26th May 2019 (Saturday & Sunday) in online (computer based mode). Students take this exam to get admission into MBBS programme in the AIIMS institute. There is a total of nine AIIMS institute located all over India. It is a national level entrance exam. At first, candidates need to register online and then required to obtain the qualifying cut-off marks to get admission into AIIMS MBBS programme. Through this exam, candidates can get admission into nine AIIMS Institutions located in New Delhi, Bhopal, Rishikesh, Patna, Jodhpur, Guntur, Nagpur, Raipur & Bhubaneshwar. Please go through this article to get information about AIIMS MBBS 2019 including the application form, exam dates, eligibility, exam pattern & syllabus, etc. Today (9th April 2019) is the last date for making the exam city choices for the candidates who have completed their Basic Registration, Generation of Code and Final Registration. The link is open from 5th April 2019 to 9th April 2019. The AIIMS MBBS Final Registration Process has been started from 23rd February 2019. The Last Date for making the final registration is 12th March 2019. Today is the last date to re-upload the images on the application form. Earlier, the dates for uploading the images were from 29th January to 3rd February which later extended to 8th to 11th February 2019. The Final Status of the Basic Registration has been now extended to 12th February 2019. Only those candidates can check their status of the basic registration application form who have reuploaded their images between 8th February 2019 to 11th February 2019. AIIMS MBBS Authorities Released the Date Sheet on 13th November. However, due to undisclosed reasons, the notifications were rolled back. The official conducting body of AIIMS has published the examination schedule for the academic session 2019-20. The information related to the same is provided in the table given below. Any changes in the dates will be updated in the table. AIIMS MBBS 2019 Dates for some of the events for the 2019-20 session has been announced. How to Complete the AIIMS MBBS 2019 Final Registration Process? Giving preference in yes/no, whether they have appeared the AIIMS MBBS Exam earlier or not. Now after filing the above-mentioned details, enter other details such as Board Name, Residence State, Class 12th Roll Number, Marking Scheme (Percentage/CGPA), Total Marks or Scores Obtained etc. Verify all the details before proceeding to the next step. Make the fee payment. The details about the application fees have been mentioned below. Well, making the payment of the fees check the availability of the exam centers. Check the exam cities and select as per your preference. The complete details about the Exam Center will be available on AIIMS MBBS Admit Card 2019. Students who are willing to take the AIIMS MBBS 2019 entrance examination for the 2019-20 session must check the eligibility criteria. Applicants are advised to go through the eligibility criteria before doing the online registration for the test. Students must possess the eligibility criteria in order to apply for AIIMS 2019 MBBS Exam. The criteria related to academic qualification, age & nationality are provided in the table below. 1. Nationality Candidates must be citizens of India. 2. Age Criteria The minimum age limit should be 17 years as on 31st December 2019. 3. Qualification Criteria Candidates must passed class 12 (under 10+2 scheme)/SSC examination (CBSE) or Intermediate Science (ISc) or its equivalent examination. 4. Subjects Pass the above qualifying examination with PCB & English subjects. 5. Qualifying marks GEN/OBC & OCI Candidates: Score minimum 60% aggregate marks in Physics, Chemistry, Biology & English subjects. SC/ST/OPH & Foreign Nationals Candidates: Score minimum 50% aggregate marks in Physics, Chemistry, Biology & English subjects. NOTE: Candidates appearing for the qualifying 10+2 exam in the year 2019 can also apply for the AIIMS 2019 exam. Admission to the MBBS exam will be granted based on the class 12 marks and entrance test score. The All India Institute of Medical Sciences, Delhi have activated the link to choose the examination city center. The link is activated from 5th April 2019 to 9th April 2019. The Final Registration Process for AIIMS MBBS 2019 has been started from 22nd February 2019. Candidates who have generated their Unique Codes can go for the Final Registration Process. Candidates who have successfully completed their Basic Registration can proceed for the AIIMS MBBS Final Registration Process. To complete the Final Registration Process, candidates have to enter their Registration ID, Unique Code, Password and Captcha Code to continue with the process. PAAR Basic Registration has been extended. The dates for the availability of AIIMS 2019 online registration form had been published by the authorities. The Final Status of the Basic Registration was 28th January 2019 which has now been extended to 5th February 2019. Step by step guide to apply for the AIIMS MBBS 2019 is provided below. The application fee for different category candidates is provided below. Before doing online registration, candidates are advised to go through the eligibility criteria properly. The Basic Online registration for AIIMS MBBS 2019 was started on 30th of November 2018. The Deadline date to upload the correct images is now from 29th February 2019 to 3rd February 2019. Follow the steps below to apply for AIIMS 2019 MBBS Application Form. Click on the link “AIIMS official website”. Clicking on this link will redirect to the official website of AIIMS. Navigate and search for the link “New Registration”. The link will be activated here once the online registration gets open. Enter the general details like mobile number, email ID & other details. Verify your email ID and Phone number. Fill up the application form by entering personal details, corresponding address & academic qualification, etc. Upload the scanned image of the photograph & signature as per the specification. Pay the application fee as per the amount mentioned below. Go through the entire filled up form carefully and submit it. Save, download & take the print out of the filled up application form for future reference. NOTE: To get the detailed information related to AIIMS MBBS 2019 Application Form. Amount to pay as application fee for registration varies from category to category. Candidates need to deposit the application fee in online mode through Credit Card/Debit Card/Net Banking. 3. Shifts The examination will be organized in two shifts, i.e. 9:00 AM to 12:30 PM (Morning) & 3:00 PM to 6:30 PM (Afternoon). 5. Language English or in Hindi. 6. Number of Questions Total 200 multiple choice (objective & reason-assertion) type questions will be asked in the exam. 7. Subjects The questions will be asked from Physics, Chemistry, Biology and General Knowledge/Aptitude. 8. Marking Scheme Each correct response will get a score of one mark. 9. Negative Marking Each incorrect response will get a score of – ⅓ mark. Candidates who have registered themselves for AIIMS MBBS 2019 must check the syllabus of the same for the preparation. The standard of question paper is generally of class 11 and 12 levels. The subjects from which the question paper contains in the test are physics, Chemistry, Biology, and General Knowledge/Aptitude. The topics contained in each of the section is provided in the table below. 2. Chemistry Solid State, Solutions, Electrochemistry, Chemical Kinetics, Surface Chemistry, General Principles and Processes of Isolation of Elements, p- Block Elements, d and f Block Elements, Coordination Compounds, Haloalkanes and Haloarenes, Alcohols, Phenols and Ethers, Aldehydes, Ketones and Carboxylic Acids, Organic Compounds Containing Nitrogen, Biomolecules, Polymers, Chemistry in Everyday Life. 4. General Knowledge Geography, history, India Independence, science, international organizations, computer science, current affairs. AIIMS MBBS 2019 Admit Card will release on 15th May 2019. Registered candidates can download the admit card on entering the valid login credentials. The university will not send any SMS or hard copy of admit card via post. Candidates must download by visiting the official website and carry the admit card along with one valid Govt ID proof and passport size photograph. Candidates without admit card will not be allowed to take the test under any circumstances. AIIMS MBBS 2019 Admit card contains the details like examination center address, date and time of the test. How to Download the AIIMS MBBS Admit Card 2019? Enter the Registration Number and Password to Login. Keep the printout of the Admit Card safe until the completion of the examination process. With the help of AIIMS MBBS 2019 answer key, candidates who took the AIIMS 2019 test can match their responses with the official answer key released by the AIIMS. The official answer will release a few days after the test but various coaching institute publishes the answer key few hours after the examination. The OMR answer key sheet will release in PDF format. As per the notification released by AIIMS 2019 for the entrance exam being conducted on 26th and 27th May 2019 for MBBS, the final date for the declaration of the result is 28th June 2019. The result will be available online only for those candidates who have taken the examination. Candidates will have to log in to the individual account to view and download the result. The AIIMS MBBS 2019 Result will contain the candidate’s name, roll number, father’s name, category, and result. The result of each candidate will state whether he/she is eligible for counselling and admission procedure. The Result will be available in PDF Format so that it can be easy to download. The AIIMS MBBS 2019 cut-off is the minimum qualifying marks required to qualify the AIIMS 2019 entrance examination. In some of the exam, cut-off refers to the opening and closing of rank. The cut-off for AIIMS MBBS 2019 will be released a few weeks after the result has been declared. By cut-off mark, candidates who took the exam can check the cut-off mark with the obtained mark to know whether they have qualified for the exam or not. The AIIMS MBBS 2019 cut-off for general category Candidate is expected to be 50%, 45% for the OBC candidates and 40% for SC/ST candidates. Candidates who obtain more than or equal to the cut-off mark will be eligible to participate in the counselling & seat allotment procedure. Since the exam will be held in two sessions, a normalization procedure will be considered to prepare the cut-off. If there are different percentiles from both the shifts, the lower of the two percentiles will be taken as the cut-off for all the candidates. AIIMS releases the merit list after publishing the cut-off mark. Candidates who obtain more than or equal to cut-off mark becomes eligible to appear in the merit list. Merit listed candidates are eligible to participate in the counselling & seat allotment. Based on the merit list various counselling rounds are conducted. AIIMS MBBS 2019 Merit list contains the details like name, roll number, remark, qualifying status, percentile score and other important details. There are various rounds of AIIMS MBBS 2019 counselling takes place based on the merit list. After the results have been declared, eligible and qualified candidates will be called for counselling. Counselling schedule & dates for the counselling & seat allotment will release in PDF format. Candidates need the report to the designated counselling venue in person along with the necessary documents. AIIMS MBBS 2019 Dates for the reporting will be updated here when it will get released. Can I edit/modify the exam center after the last date? Ans: No, once the exam city is submitted then it cannot be changed later. Are any documents required to be uploaded at the time of online registration? Ans: Any kind of documents are not required to upload during the online registration. Only scanned images of photograph & signature are required to upload. I have caste certificate in regional language. Will it be acceptable at the time of admission? Ans: Caste certificate in English and Hindi language is acceptable. How many times can I appear for AIIMS exam? Ans: There is no limit to take the AIIMS MBBS 2019 test. If anyone has a query related to AIIMS MBBS 2019. Then please inform us by writing in the comment section given below. 3 How to Complete the AIIMS MBBS 2019 Final Registration Process?